St. Vincent de Paul of Baltimore is celebrating 150 years of serving Baltimore area residents facing hunger, homelessness, unemployment and poverty. While we honor our past, we must also look toward the future and focus on reaching more people with resources to escape the complex realities of poverty and homelessness. St. Vincent de Paul of Baltimore is celebrating 150 years of serving Baltimore area residents facing hunger, homelessness, unemployment and poverty. Started just after the end of the Civil War at Baltimore’s Basilica of Assumption, the first members sought to live their faith by caring for others, becoming pioneers in the development of social programs to help the poor. They attended to the basic needs of the poor, providing food, clothing and coal for heating homes. For most of its history, St. Vincent de Paul consisted of three principal functions: parish conferences, the summer camp, and the collection bureau thrift store. In the decades since, the organization significantly expanded its community services, adding programs focused on housing, homeless services, employment training and counseling, early childhood education, and services that focus on assisting individuals and families in need with a goal of breaking the cycle of poverty. One hundred fifty years later, the organization has grown to be one of the largest human service nonprofits in Maryland, reaching thousands of city and county residents annually through 13 programs, and a yearly operating budget over $20 million. As part of commemorating the 150th years of serving Baltimore, St. Vincent de Paul will launch a new event, “Flashlight,” a one-night sleep out to raise awareness and financial support for their programs that serve families and individuals struggling with homelessness. The event will be held Saturday, November 5, 2016 at the Timonium Fairgrounds infield, featuring live bands, food trucks, games and more in solidarity for the homeless. For more information, visit Flashlightevent.org. Recognizing the need to invest in the future, the organization has launched the For Your Love Alone 150th Anniversary Capital Campaign with the goal to raise $10 million for the expansion and renovation of the Sarah’s Hope, Mount Street family shelter and to update the organization’s information technology and infrastructure. “St. 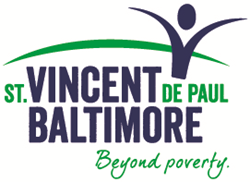 Vincent de Paul of Baltimore is proud to play a part in supporting the thousands of Baltimoreans who are working hard to move beyond the challenges of poverty and achieve a better future for themselves and for our community,” said Schiavone. “We look forward to building on our strong foundation for the next 150 years providing resources to help people escape poverty and homelessness and improve their quality of life,” Schiavone added. To see more from the 150 years of St. Vincent de Paul, visit the 2015 Annual Report at http://www.vincentbaltimore.org.